Bad Boss XXL – VW Golf GTI meets Rocket Bunny and 19 x 12″ Wheels! BMW GTS-Plus: IND’s 10th Anniversary M4! “Grand Theft Ferrari”: Sidney Hoffmann’s 599 GTB Joyride! 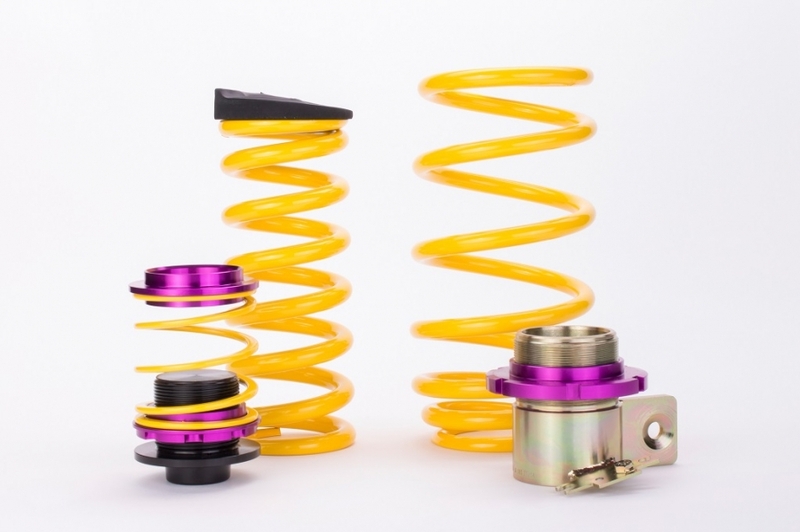 ST performance low spring kit for Ford Focus III RS launches! VTEC just kicked in, yo! KW V3 now available for Honda Civic Type R (FK2)! KW Clubsport ensures a new record: 911 is faster than the 918 Spyder! Milltek Sport’s American Icon – Ford Mustang meets KW V3! Caractere full body kit for New Audi A4(8W) Sedan+Avant is available now! Some Akrapovič exhaust systems are going to be available quite soon. Ragazzon central end pipe cat back exhaust system for Mercedes Benz A180 & A200(W176) is available now! Scorpion downpipe & cat back exhaust system for Honda Civic Type-R(FK2) can order now! Scorpion downpipe & cat back exhaust system for BMW M235i Coupe(F22) can order now! KW DDC ECU – control your new Audi RS3 with your smartphone! Scorpion exhaust system for Mini Cooper S(F56) can order now!!! For every demand the perfect suspension – since more than 20 years! Drop Dead Beautiful: Vossen’s ultimate BMW Wagon! Wagner Competition Intercooler for BMW F06/F07/F10/F11/F12 can order now!!! Are you using KW professional tool kit to install your KW coilover kit? Wagner intercoolers are available now! Scorpion downpipe, cat back & rear muffler for Ford Fiesta 1.0 EcoBoost(JA8) is available now!!! Scorpion downpipe & cat back exhaust system for Volkswagen Golf VII R is available now!! Wagner Competition Intercooler Kit EVO2 for VW T5 is available now!! JDM seduction: Toyota GT86 meets KW V3 and KW HLS! BMW 5-series – KW Coilovers for all 5-series and M5 Generations! Speedhunters Summer of Swag – Mitsubishi Evo X owner wins KW Variant 3! KW height adjustable springs for Mercedes-AMG GT! Akrapovic new AUDI CATALOGUE is now available in CHINESE language! It’s a kind of M(3)agic: M3 sedan meets KW Clubsport! Bastuck rear valance insert for BMW 4 series(F32 Coupé and F33 Convertible) is available! Bastuck rear valance insert for BMW 2 series(F22 Coupé and F23 Convertible) is available! Swiss Chiptech for Porsche 911 Turbo/Turbo S(991) can order now!!! KW HLS(Hydraulic Lift System) – Increased clearance at the push of a button! QuickSilver valves exhaust system for Maserati Ghibli S and Q4 petrol is available. Peugeot 208 GTi gets the Scorpion Exhaust treatment! CARACTERE EXCLUSIVE is pleased to present its all-new conversion kit for the RANGE ROVER SPORT. If you buy a Option Fans, you will get a KW V3 $2500 coupon. 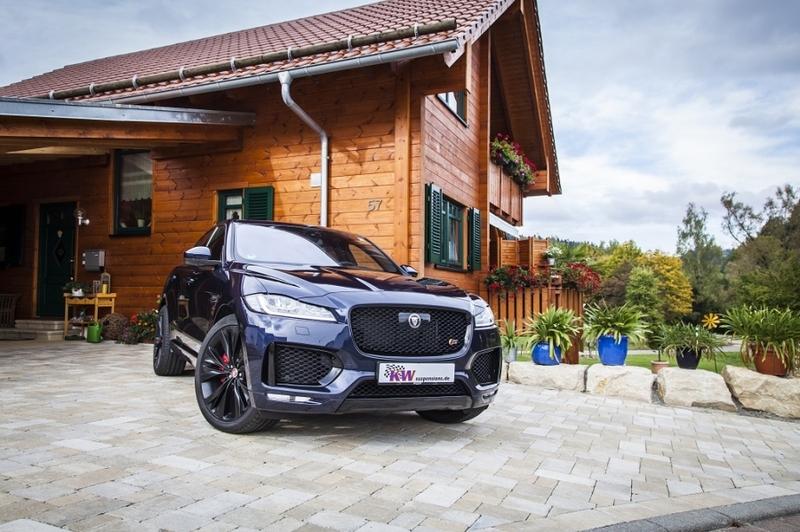 The segment of SUVs is growing worldwide and now the traditional British brand, Jaguar, offers their take on a “Sport Utility Vehicle,” the F-Pace. As one of the few suspension manufacturers, KW also offers suspension springs that are individually adjustable in lowering. 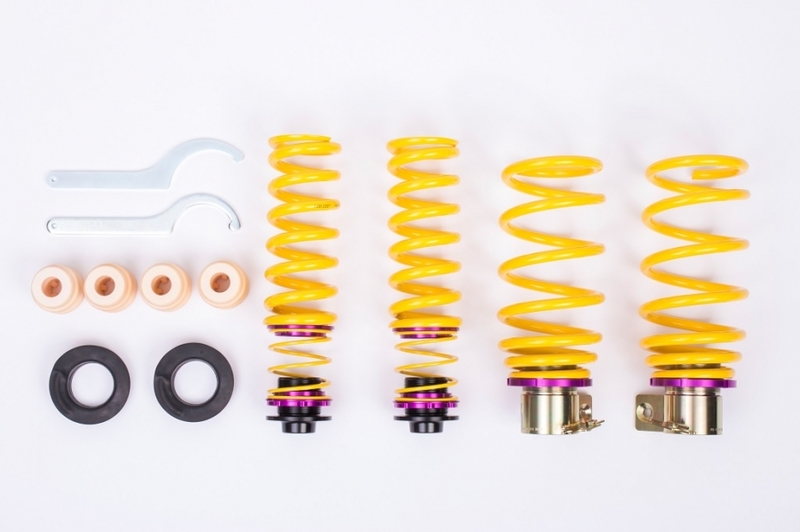 Unlike regular lowering springs, the KW coilover springs enable precise height adjustability. Adjusting the level is similar to a coilover kit. When installing our springs, the series components are replaced by our dust protection elements, bump stops and the KW springs with threaded sleeves. The conversion can be carried out in every specialist workshop and even in a tire shop. The variable lowering has the great advantage that when changing the wheel / tire combination, the lowering can be adapted to the new rims in just a few steps. With our KW coilover springs that are individually adjustable in height, the F-Pace can now be continuously lowered from 15 – 30 mm in combination with the series dampers. In combination with the adaptive series dampers in the F-Pace, a harmonious and direct driving behavior is realized by the KW coilover springs. 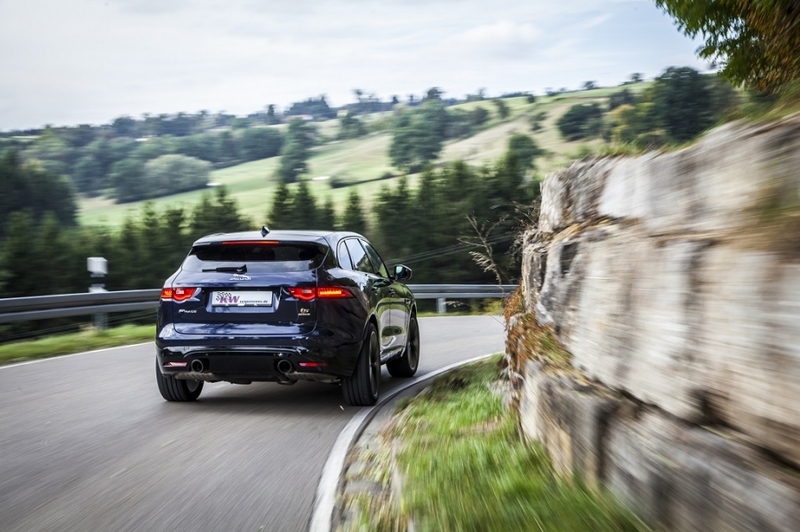 Even at extreme driving maneuvers and sudden load changes, the springs increase the agility of the Jaguar SUV with up to 380 hp, without compromising driving comfort. On our Website www.kwsuspensions.net you’ll find all information about our height adjustable KW springs for the Jaguar F-Pace. Simply dial your car at the KW product finder. At the moment the springs are only available for F-Pace models with adaptive suspension.